Lt. Gov. David Dewhurst and Sen. Dan Patrick gave the first details of what they promised would be a wide-ranging set of proposals for public education policy during the upcoming legislative session. 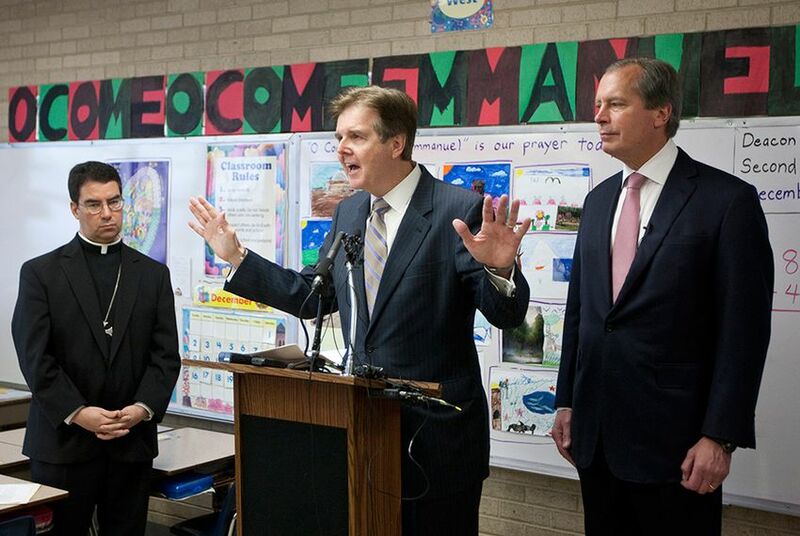 Speaking in a Catholic school classroom in Austin, Lt. Gov. David Dewhurst and state Sen. Dan Patrick gave the first details of what they promised would be a wide-ranging set of proposals for public education policy during the upcoming legislative session. Patrick, a Houston Republican who chairs the Senate Education Committee, said he would carry legislation that would increase the options for public school students through lifting the state's cap on charter schools, fostering open enrollment within and across school districts, and creating a private school scholarship fund through offering a state business tax savings credit to corporations. When asked for further information about how such a scholarship program would operate, Patrick said the plan was still in its formative stages, and earlier, Dewhurst indicated that it may begin through a smaller-scale pilot program. Patrick also said he would revamp the accountability system by reducing the number of required state tests and increasing the pathways to graduation for high school students interested in technology. A new system would also evaluate school districts with letter grades instead of the current ratings of acceptable or unacceptable. Though the set of reforms the two men described at the news conference did not contain a plan for what are often called private school vouchers, which allow parents to use public funding to send their children to private schools, Patrick said afterward that the legislation was still evolving. He indicated that it could include a measure that would be along the lines of "what some people might call vouchers." The lieutenant governor took the opportunity that to announce that in the wake of the Connecticut elementary school shooting, lawmakers would consider a bill that would create penalties for school districts that did not maintain updated safety plans. Attorney General Greg Abbott said earlier this week that 78 were currently out of compliance.